“The court was presided over by Acting Chief Justice Shirani Bandaranayake, considered a Rajapkasa loyalist. Several days ago, the president made a show of appointing her in place of Chief Justice Asoka de Silva, who was thought to be more sympathetic to the case but is traveling abroad.” the US Ambassador to Colombo wrote to Washington. A leaked US diplomatic cable records the Supreme Court decision on General Fonseka’s Fundamental Rights petition re his unlawful detention. The Colombo Telegraph found the cable from WikiLeaks database. The cable written on February 24, 2010 and classified as “CONFIDENTIAL” by the Deputy Chief of Mission Valerie Fowler. “The court adopted the Attorney General’s argument that Fonseka’s claim that there was no reason to detain him could be verified until the investigation had been completed. While no charges have been filed against Fonseka, areas of investigation mentioned by the Attorney General included the alleged 400 army ‘deserters’ at the hotel with Fonseka during election day, Fonseka’s statement that he would release ‘top secret’ information on the final stages of the war, and the Hi-Corp military procurement corruption case involving his son-in-law.” ambassador Butenis further wrote. Several senior human rights lawyers practicing in Colombo have told the Colombo Telegraph that Chief Justice Bandaranayake cannot be regarded as impartial and independent in cases involving sensitive political issues, particularly those that have a connection to the Rajapaksas. 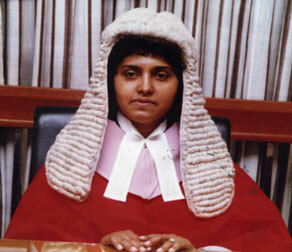 Dr. Shirani Bandaranayake’s direct elevation to the Supreme Court from the Faculty of Law at Colombo University during the Kumaratunga administration was itself a political appointment, in which her mentor at the Law Faculty, the then Justice Minister, and present Foreign Minister G.L. Peiris played a key role. Following her husband’s acceptance of a political appointment from the Rajapaksa regime, however, any semblance of independence that remained has completely disappeared. From the US Embassy cable below, which deals with the fundamental rights application of Sarath Fonseka challenging his detention following the presidential election in January 2010, it would seem that Ambassador Butenis also did not believe in the judicial independence of Justice Shirani Bandaranayake. attended the hearing. END SUMMARY. 26, 2010, after the parliamentary elections.